It is not often that I stumble across a product that I find myself wanting to tell everyone about, as I am 1) excited to have found out about it, 2) love what it has to offer, 3) know other parents/grandparents would love it, too. This is the case with the Sparkup reader I was recently sent to review. 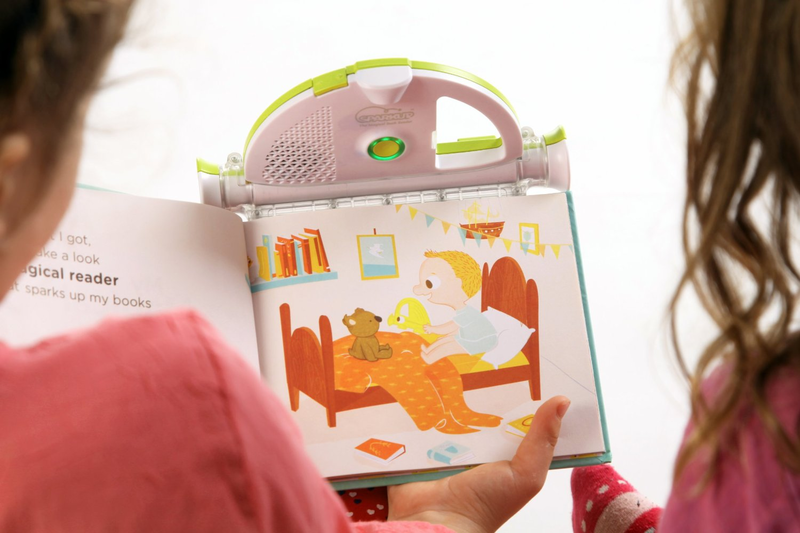 The Sparkup reader is considered a magical book reader, as it has a little built in camera that can detect recorded book's pages, as it reads a child's book to them, that you have previously recorded on the book reader. Don't think you can fool the Sparkup Magical Book Reader by flipping ahead a few pages, or skipping a page. With the built-in camera, it detects this and will skip to the page you are currently viewing and read your recorded voice. This was my daughter, Savannah's favorite feature as she really though it was magic, and would try her hardest to throw the book reader off. She thought that if she flipped through the pages fast enough, or turned a few pages at once, that the book reader would flub up and read the wrong text --- but, time and time again, it would detect where Savannah was in the book, and read that particular page. :-) MAGIC! Recording your own book to this reader is a breeze, with 3 easy steps. *Please see this one-page PDF for more details on how to use the SparkUp reader. In addition to recording some of your child's favorite books to the Sparkup reader, you can also purchase other books directly from the SparkUp online store, then plug your reader into your computer with the included USB cable and download the professionally recorded stories directly to your book reader. Once done, clip the Sparkup to the book, press the center button, and your little one is ready to enjoy a bedtime story, etc. 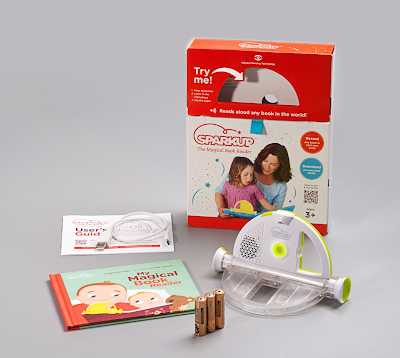 "Sparkup can store up to 250 minutes of audio, or approximately 50 recorded storybooks. Transfer files onto your computer to make room for more recordings on Sparkup. It's easy! There's no software to install." Beginner readers looking to practice their reading skills, but that want to have you make sure they are pronouncing words right. Bringing a photo album to life, as you narrate who is in the photo, where was it taken, etc. I could go on and on just thinking how this book reader would come in handy for parents with children. While we are in a day and age that everyone is connected to their wireless devices, kids shouldn't have to rely on storybook apps or games to keep them entertained. Instead, why not sure your love of books with them. By introducing the Sparkup reader to them, reading will become more fun, as they will love being able to hear your voice, or those they love who can't be there to read to them, as they settle in to read/listen to a good book. My girls are too young to start reading on their own yet. But, they still love to look at the illustrations and follow along when books are read to them through this book reader. I can even read the books I record with funny voices or add in feeling when recording, to make the overall reading experience with the Sparkup reader unique and that much more enjoyable. 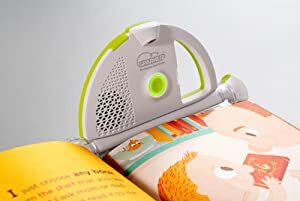 So, if you plan on surprising your child with books this holiday season, as a way to instill a love of reading and books with them, why not go one step further and pick up this book reader. Non-book lovers can't help but sit down to have a story read to them from a parent or relative. And, like my daughter, your child will love trying to have the reader hiccup and read the wrong page -- even though the book reader is magical and knows best. ;-) I personally want to thank the parents over in Israel who are behind this amazing electronic device, as they are not only opening the eyes of my daughters and getting them excited about reading, but other parents are seeing similar reactions when their child clips a book onto the book reader. Books can finally be enjoyed again -- in a fun, new way! To learn more about the Sparkup magical book reader, visit their website here: website; or watch this video now. In addition to the online local retail stores you plan to hit tomorrow and on Monday, why not make a point to visit the Sparkup store online and pick up this reader. The Sparkup reader usually retails for $79.99 MSRP, but for the upcoming holiday weekend, you can get it for only $39.99. In addition to the reader, this special price also includes 2 FREE audio and printed books. What a great deal, and one that will not last long! So, make a point to head over to Sparkup online store tomorrow and be one of the first to use coupon code "SparkUpMyBooks" to get this special price. Note, that this coupon code is only valid until Dec. 3rd, so don't delay. Don't forget to follow SparkUp on Facebook and Twitter, to stay up-to-date on special offer, new book additions and more.